There is also a wealth of local experience and resources you can draw on to help with a recruitment campaign. Ask for help using the Yahoo email groups, talk to your district master or talk to the association webmaster about support for your online campaign. Hiring a mini ring for your summer fete can be a great way to stimulate interest in your local community. 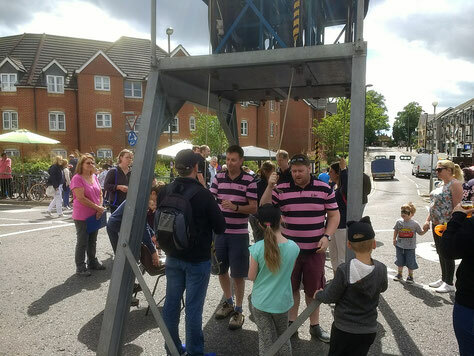 This picture was taken in Caterham High Street, just one example of the experience local ringers have in recruiting for their towers. The Charmborough ring, featured in the photo above, have a website with information about hiring their bells for your event and gallery of photos and resources to help you. Also consider using one of the associations display boards.